make the difference between industry acceptance and being just another small fish in the industry pond. The best way to ready ourselves for this shifting environment is Continuous Learning. 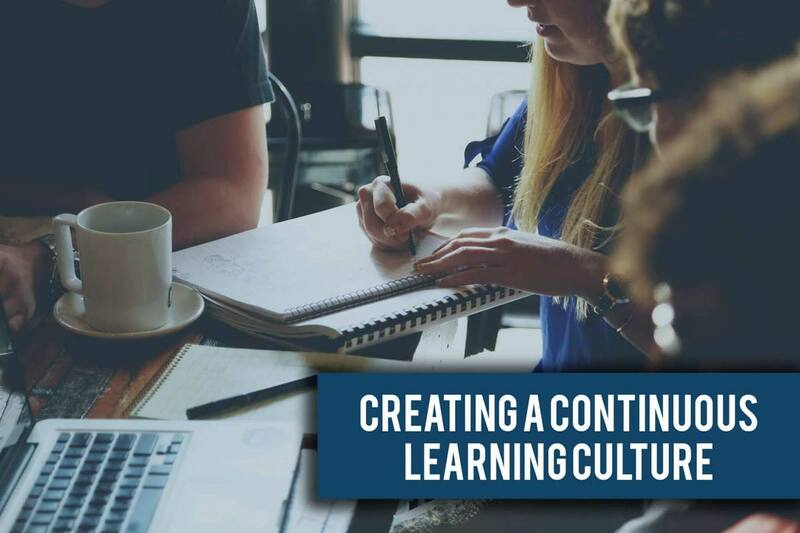 Continuous learning is an established persistent learning process, designed for bolstering the knowledge and skills of your workforce over time, and presents itself in many forms. There are various obstacles to keeping your staff above the knowledge threshold, including the likes of organizational busyness, lack of individual drive, and lack of an industry focus to cause a true change in the way we may think. Yet there are a few simple things that your organization can implement immediately to overcome these obstacles. An Open Environment – Establish to your employees early on that it is ok to ask questions when something is not understood. Senior level people often have the required information on the tip of their tongue and are more than willing to demonstrate what they know. Use this as an opportunity for knowledge transfer. Also, do not be afraid to give your employees some supervised free-reign; let them try new ways to approach reoccurring problems with alternative methods and comprehension. This may lead to developing processes that can inevitably improve departments and organizations as a whole. Mentorship – When onboarding new employees, be sure to pair them with employees who have been in their role, department heads, or are simply in their department. This can establish a line of communication and lead to increased knowledge transfer. This will also allow the new employee to evaluate past ventures with a new eye and establish any possible shortcomings, shaping an environment where the organization can actually learn from their previous mistakes. Learning Management Systems (LMS) – it would be a total let down if I did not at least throw in a reference to digital learning. There are structured eLearnings and mLearnings beyond the typical certification requirements which allow for the continuing and necessary education of your people. This can include advanced sales techniques, introductions to hidden product features, and techniques to hone their craft dependent on their job title and responsibilities. External Education Incentives – Some organizations are big on continuing education. This can be as rigid as convincing employees to go to collegiate courses to as lean as instructing an employee to schedule 30 minutes a quarter of self-guided learning via YouTube videos. With the availability of online seminars, actual seminars rolling through your town, and even trade shows consisting of industry leaders, it is hard to ignore this method for continuing education. If their availability was not enough, these types of learning structures can be incentivized which in general can lead to the largest absorption of external knowledge for your employee base. Soft-Skill Development meetings and discussion of current happenings – Some organizations require this type of training, especially in the consultancy field; where everyone needs to be able to continuously improve their intrapersonal skills. Theses training initiatives are unique in that they allow for employees to relay their outward communications and how they handled certain crisis scenarios to their colleagues, ask the best method of approaching difficult discussions and problems, and get another frame of reference from an outsider with differing experiences than themselves. These types of meetings go a long way towards establishing protocols for how to deal with these sorts of impediments over time, as well as provide a sense of unity to the participants by further establishing a new channel of communications. Organizational Book Clubs – Many start-ups have instituted book clubs to aid in their organization’s knowledge development. This is best instituted when leadership determines topics that they feel are imperative for their staff to undertake, per quarter and selecting a few highly rated books from an internet search, which may further those initiatives. Social Learning – Encourage your employees to develop professional social media accounts and link with colleagues and various industry professionals, with instruction to follow a few very active members in their selected fields. This will provide for a couple of things, the first a stream of information from industry leaders on industry best practices, the ability to share said best practices with their colleagues, and a means to bolster the organization’s reach as a whole. In short, continuous learning is one of the most important commitments your organization can make, and there are many methods to implement a quality program. Take the time to evaluate this list and see if any of it could be applicable to your organization. You may find hidden knowledge contained in your employees that you were unaware of, as well as an improved sense of self throughout your organization. Also, please join me as I continue to delve into components of the learning industry.